FLASH SALE – This week only! • Are you Spring Break swimsuit ready? Take on the Day with a Healthy, Balanced Body. See change in INCHES, not just pounds… in just 7 days… NO CHANGE IN EATING PLAN! The most important thing we want you to know is this is a Total Body Cleanse. 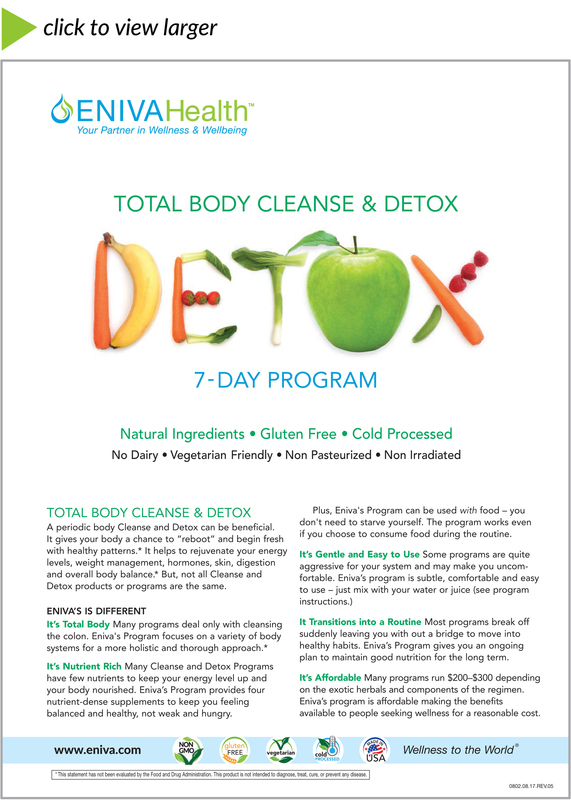 Many Detox and Cleanse programs on the market deal just with cleansing the colon. Eniva's Program focuses on a variety of body systems for a more holistic and thorough, yet very gentle approach. Yes, our products help cleanse the colon, but they also assist with the entire detoxification process which involves the liver, kidneys, gallbladder, intestines, blood and many other organs and body systems. • 1 VIBE Fruit Sensation – 32 oz – Helps with total body detox and counteracts free radical damage; supports the health of cellular DNA. * VIBE provides a nutritional foundation specifically formulated with your heart in mind! The natural flavor is a pleasing treat that gets you moving! The heart focused formula is validated with RDA nutrients, concentrated fruit, vegetable and aloe vera extracts, as well as a specialized and decaffeinated green tea EGCG catechin complex. This formula incorporates the many benefits of the VIBE Original formula, with a few special additions: increased magnesium, enhanced antiOX fruit and vegetable blend, increased niacin (Vitamin B3), increased natural vitamin D and enhanced synergistic green tea combination. For VIBE option with 20 packets > click here. Bio-Chlor Liquid Green Complex has many health benefits as it is an internal conditioner, digestive tract detoxifier, supporter of healthy oxygenation and cellular membranes as well as intestinal and circulatory health. It is also a body deodorizer. Add this Health Pack above for quick ordering. ~ OR ~ Add individual products to cart below. • Mind/Body Connection* – The overall process of releasing unwanted substances the body is holding onto can have a cathartic effect for a number of other emotional and physiologic conditions, too. With a Cleanse, the body systems, including adrenals, get the chance to begin fresh in a healthy pattern. You may find you can deal with stress better, without getting overwhelmed. * You may also notice a lessening of feeling “blue,” anxious or angry. 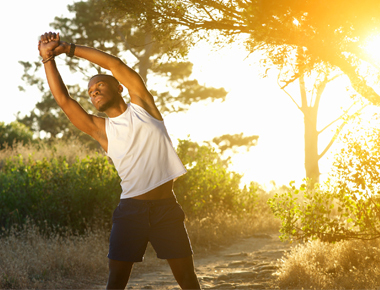 * Be sure to incorporate other healthy mind and body practices, such as breathing, meditation and relaxation. • Look Better, Too! A cleanse not only helps your inner body, it reinvigorates your outer skin and hair, too. * Many people report they appear years younger after they have done a Detox and Cleanse. * Often times toxins in the body manifest as skin irritation or rashes. A cleanse can help address accumulated toxins and give the skin a chance to glow in its natural, healthy state. Many Detox and Cleanse Programs have very little nutrients to keep your energy level up and your body feeling nourished. Eniva's Program provides you with four nutrient-dense supplements to keep you feeling balanced and healthy, not weak and hungry. Plus, Eniva's Program can be used WITH food – you don't need to starve yourself; the program works even if you choose to consume food during the routine. Be sure to consume a large amount of water during the 7 Days – preferably half your body weight in ounces per day. This helps better facilitate the movement of the accumulated wastes and contaminants out of your body. Try to use the most purified water source you can find, so as to avoid introducing further toxins into your body from a water source filled with chlorine or other chemicals. A poor diet is a major contributor to a stressed liver and toxic buildup. Consume a diet rich in whole foods, with as much raw and organic materials as possible. Avoid processed foods, as well as those high in sugar and caffeine. Fresh fruits and vegetables are vital to maintain a body environment that can detoxify itself naturally. Get Moving. Exercise supports the elimination of toxins from your body. It also supports healthy digestion. In additional to aerobic exercise, many people incorporate bouncing on a mini-trampoline to support their efforts toward elimination and ongoing detoxification. Be sure your air source is clean. Avoid body care and hair products that contain toxic ingredients. Also decline using home cleaning products that do not originate from natural ingredients. Avoid alcohol and stop smoking. Alcohol and cigarette use are two major contributors to body toxicity. NOTE: Results may vary and not be typical of what the average consumer will achieve. Eniva supplements do not guarantee weight loss. Consult your healthcare provider before starting any nutritional supplement program/product.